Another “How To:” guide. It’s not intended as a ‘verbatim’ method of solving this little problem, but more of a starting point. I had an email from someone who has a tow vehicle that when he turned on his rear fog lights, the vehicle rear fog lights came on at the same time as his caravan fog lights. He wanted to be able to turn off the vehicle fog lights and leave just the caravan rear fog lights turned on so he wouldn’t be dazzled at night by the front of the caravan being lit up bright red by the vehicles fog lights. On the face of it, it would be quite simple to install a switch to turn off the vehicle fog lights, but we have a few things we have to take into account. If we simply installed a switch to turn off the vehicle fog lights, we could in theory with out a trailer attached have the fog light switch turned on and the light to tell us they are on lit, but with our other switch have them turned off. Also for the MOT test if we have left our installed switch off, the vehicle would fail as the rear fog lights would not work. Under current law, rear fog lights must be fitted to a vehicle, and there must be a visible indicator on the dashboard to show the lights are turned on. Fog light must only operate if the vehicles side lights are turned on. If fog lights are fitted to a caravan (or trailer) they must be serviceable and there must be an indication in the vehicle that the light(s) are operating (turned on). Simply wiring the caravan (or trailer) fog lights into the same circuit as the tow vehicle fog lights therefore complies with the law. So can we make it so that we can turn off the vehicles fog lights? 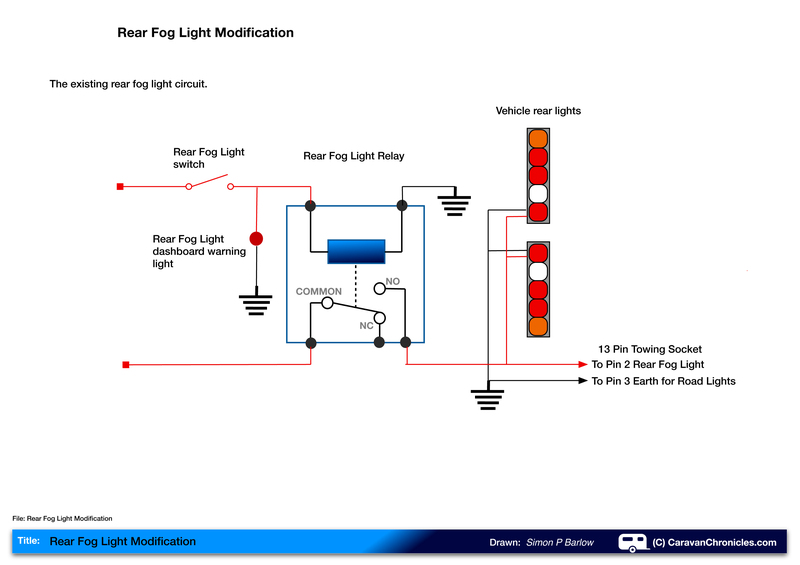 Now if you are reading this and have a tow vehicle that has a CANBUS system, the vehicle manufacturer will have a software update that will turn off the vehicle fog lights automatically if a trailer is detected. You will need to speak to your dealer about this. OK, so lets have a look at the typical wiring for the rear fog lights on non CANBUS vehicles. This drawing is generic, so don’t assume your vehicle is exactly like this. If we look at the drawing above, we can see that turning on the fog light switch energises the relay and that allows current to flow to the rear fog lights on the vehicle. At the same time, the dashboard warning light for the fog lights is illuminated. The feed for the relay switch will usually come from a circuit that is only powered when the side lights are turned on. If we install a two-way switch across the contacts of the relay and connect this to Pin 2 of the towing socket (disconnecting the existing wire between Pin 2 and the rear fog lights) we can now control the electrical feed to the caravan’s (or trailer’s) fog light circuit. We also need to install a second warning indicator light next to the switch. With the switch in position ‘1’, the circuit works exactly as it did before, both the vehicle and the caravan rear fog lights illuminate when you turn on the vehicles rear fog light switch. However additionally, the second warning light now also comes on to tell you the electrical feed to the caravan’s (or trailer’s) fog lights is live. If we just want to turn on the caravan’s (or trailer’s) fog lights, we turn the new switch to position ‘2’. It now takes the power feed directly from the common side of the relay to the caravan’s rear fog lights and illuminates the new caravan fog light warning indicator. So the vehicle still works as required by law… no matter which switch we use, we have a warning indicator to tell us the vehicle fog lights are activated and/or the caravan fog lights are activated. For and MOT test, the vehicle lights work as intended, and for the part of the MOT test that includes the 13 pin socket, it still provides the correct functionality. The rear fog lights on a caravan or trailer are usually two 21 watt bulbs, therefore draw a current of about 3.5 Amps. If you choose a switch that is rated at 4 AMps or above DC, then there will be no need to install an additional relay. For an indicator, I’d suggest a 12 volt Red LED type. You need to install the switch and indicator close to each other, in a convenient location so that you can see the indicator but not be distracted by it. If you do this modification, it will be worth while adding a short note in the vehicle handbook on how it works, just incase you sell the vehicle and don’t tell the new owner. There is nothing worse than finding a switch in a vehicle and not having a clue to what it actually does! The circuit I have drawn above is generic and you will have to work out the exact connection points on your vehicle’s wiring and install a new cable from the switch to the connection inside the vehicle where the 13 pin towing socket is wired into the existing vehicle loom. Don’t be tempted to use “scotch-loc’s’ on any part of the wiring, use the correct crimp connectors and heat shrink sleeve where required. My original question was from a fellow Landrover Freelander owner, so I could give him a drawing specifically for his vehicle. I have links to all the Landrover Freelander electrical manuals and drawings in the “Document Library” If you need electrical drawings for other vehicles, a search on-line will usually bring results. As usual, if you have any doubts about carrying out any electrical work on your vehicle contact your local auto electrician or tow bar centre, I’m sure they can help. If you found this “How To:” helpful, please use the star do-hicky thing at the top and give it a rating. Any comments or questions, please post them below. Dear Simon. A Smart Norwegian caravanner did something similar to what you have done but has made it automatic: On the caravan side of the 13-pin electrics connect pin 12 (spare) to pin 3 (earth for road lights). Inside the car connect a switchover relay where you have connected a switch. The relay is energised by current flowing via pin 12. When the caravan is connected to the car the relay opens the circuit preventing the cars rear fog lights from working. The caravans fog lights are switched on by the cars normal dashboard fog light switch as they are recieving current via pin 2. I do not know if this is safe or even viable, but you would be the man to know. I did come up with this as a possible solution too, however on the UK MOT the 13 pin socket is tested and I’m unsure of exactly how the unit the MOT Technician plugs in to test the functions of the socket works, I therefore wanted a solution that would leave the pins in the socket exactly as laid out in ISO 11446 to avoid potential issues with MOT’s now or in the future. Not trying to “one up” you, but the most recent amandment to ISO 11446 that came in 2012 recommends connecting pin 12 to pin 2 on the caravan side calling this the “trailer detection functionality” se here: http://en.wikipedia.org/wiki/Trailer_Connector/ISO As pin 12 is marked “Spare” on all older wiring diagrams I doubt that the MOT test would measure that pin. Indeed…. but some manufacturers use the grounding on that pin on the socket (via the 13 pin plug) to communicate with the vehicles ECU to change the ESP Programme and ABS System, therefore adding a 12 volt supply via a relay to that pin that would be grounded when a trailer is plugged in ‘could’ affect the ECU, ESP and ABS on the vehicle. I came up with a solution that in theory will not affect any other systems on the vehicle. I have to be cautious whenever I come up with a solution that involves something like this it won’t land me in court! As you suggest in this article a simple switch in the fog light circuit will work every time. The person on the Norwegian caravan forum who had modified his car in the way I described probably had an older car. 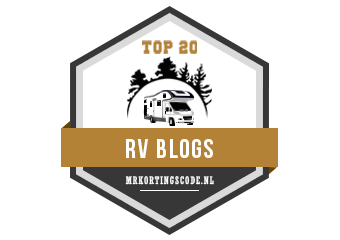 Perhaps you should amend your socket wiring diagrams to show a connection between pin 12 and pin 3 on the caravan side in order to trigger the trailer detecting functionality on newer cars. I imagine this controls various functions via the cars CANBUS system (not that I would know…). Would it be simpler just to put a cover on the car fog lights? It would.. but that would probably be illegal. I’ve found your solution clear and easy to understand. Thanks for that. You’re obviously an expert on caravan/trailer wiring and I’m hoping you can help me with a little problem. I’m intending to sort out the fog light on a flatbed trailer connected to a Mitsubishi L200. The trailer 7 pin is connected properly (I’ve tested the circuits) but when I connect the trailer to the L200 everything works except the fog light even though the fog light on the rear of the vehicle is illuminated. I’ve made the assumtion that there is no connection to the vehicle socket and plan to run a wire from the back of the vehicle fog light to pin 2. I don’t mind if both the vehicle and trailer fog lights are illuminated at the same time. 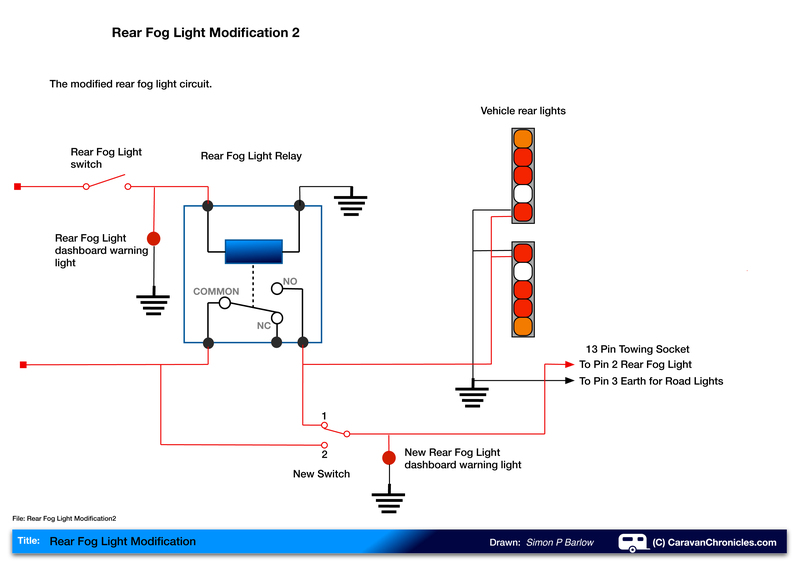 My question is, will I overload the vehicle fog light wiring by this method? I realise this is slightly off topic but your expertise would be appreciated. You could run a wire from the L200’s rear fog lights to pin 2….. however you might be on the limits of the L200’s fuse limit for that circuit. It might also be problematical as fuses tend to be OK on overload for a while then suddenly fail… not really ideal if you loose your fog light on a foggy night! A much better way would be to run a cable from an AUX power source back to the rear of the vehicle and use an automotive relay and power the trailer fog lights from this supply. Connect a cable from the L200’s fog lights to control the relay. I have used the same set up to switch a set of hi power LED reversing lights from the vehicle reversing light. I managed to fit the relay into the light cluster keeping everything neat and easily accessible. I took the power feed from the back of one of the 12 volt accessory sockets (cigar lighter) Don’t forget to include a fuse in the power supply circuit. Its a bit more faffing about but really should only cost £10 to £12 for the bits and extra wire. Perfect! A much more effective solution and fitting the relay in the light cluster is a neat idea. Cheers.